“We solemnly swear that we are up to no good!” As the Potter series continues, we take a look into the Pensieve–which will play a large role in the final film–the magical basin of memory’s stains and understandings. To read this series’ earlier entries, look no further than here, here and here. Dumbledore got to his feet and walked around the desk, past Harry, who turned eagerly in his seat to watch Dumbledore bending over the cabinet beside the door. When Dumbledore straightened up, he was holding a familiar shallow stone basin etched with odd markings around its rim. He placed the Pensieve on the desk in front of Harry. 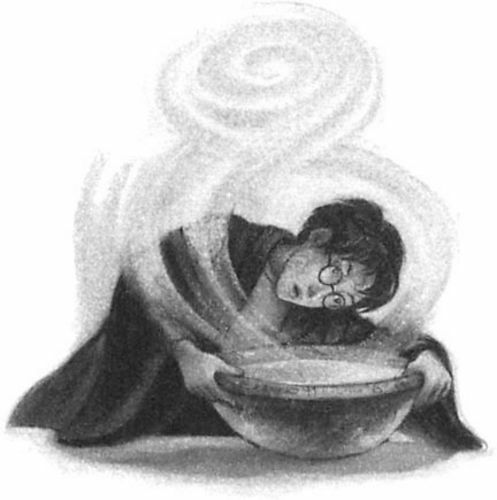 Harry had indeed been eyeing the Pensieve with some apprehension. His previous experiences with the odd device that stored and revealed thoughts and memories, though highly instructive, had also been uncomfortable. The last time he had disturbed its contents, he had seen much more than he would have wished. Harry’s reluctance to begin delving again into the Pensieve—wherein one discovers the deepest secrets and memories of others—stems from what happened the last time he used it. In his previous year at Hogwarts, he had used the Pensieve to see the worst memory of his instructional adversary, Severus Snape. What he found was the inversion of what he had thought to be true all along. Snape, deliberately cruel to Harry since his first year at Hogwarts, seemed to be cruel merely out of malice and ill will towards him. The Pensieve, instead, shows that Snape’s malice is rooted justifiably in being bullied by Harry’s father, James, when they were children. Harry, who had never known his father, yet had always lionized his memory, had always seen Snape as villain, his father as hero, Gryffindor good, Slytherin bad. This memory threw it all into conflict. I sometimes find, and I am sure you know the feeling, that I simply have too many thoughts and memories crammed into my mind…At these times I use the Pensieve. One simply siphons the excess thoughts from one’s mind, pours them into the basin, and examines them at one’s leisure. It becomes easier to spot patterns and links, you understand, when they are in this form. The Pensieve, in short, helps make sense of things. In a psychoanalytical sense, the Pensieve acts as a recordbook of the shaping elements of one’s personal history, a proper understanding of what one has dealt with and what one carries. In the sixth installment of the saga, Harry Potter and the Half-Blood Prince, Harry and Dumbledore use it precisely to examine the memories and experiences which have transformed Tom Riddle into Lord Voldemort. Harry doesn’t understand why such archaeology is necessary, but Dumbledore seems to treasure the memories as vital clues to know their enemy. Here Dumbledore invites Harry into his first memory of who would later become Lord Voldemort, a troubled and friendless orphan with a penchant for pain. There he showed contempt for anything that tied him to other people, anything that made him ordinary. Even then, he wished to be different, separate, notorious. He shed his name, as you know, within a few short years of that conversation and created the mask of ‘Lord Voldemort’ behind which he has hidden for so long. I trust that you also noticed that Tom Riddle was already highly self-sufficient, secretive, and, apparently, friendless? He did not want help or companionship…He preferred to operate alone. The adult Voldemort is the same. You will hear of his many Death Eaters claiming that they are in his confidence, that they alone are close to him, even understand him. They are deluded. Lord Voldemort has never had a friend, nor do I believe that he has ever wanted one. To read Part 5: The Mudblood, click here.